I popped into the school library this morning, and this is what I saw. The men in our building decided to have a guys-only cookie exchange. They had to bring 5 dozen cookies. They had to do all of the baking on their own. I love this idea! 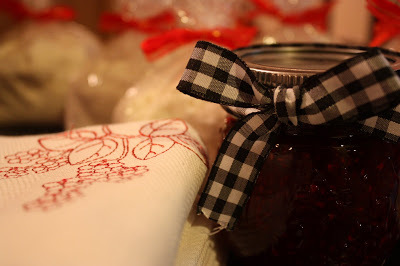 I’m sad to say, I didn’t get to try any of the mouthwatering goodies, but I’m trying to practice a little self control when it comes to sweet treats this season. I was very impressed with the variety as well as the quality of their cookies. I hope this is the first year of a great tradition for these guys! 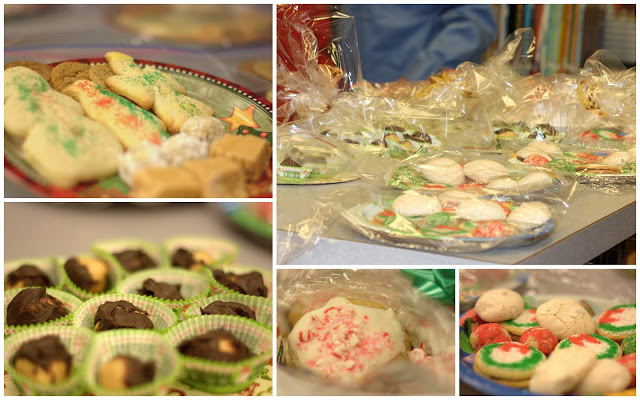 By the way, our staff had another cookie exchange over the weekend and the girls were invited to that one too. So, please don’t worry that we were feeling left out! It’s just like clockwork. 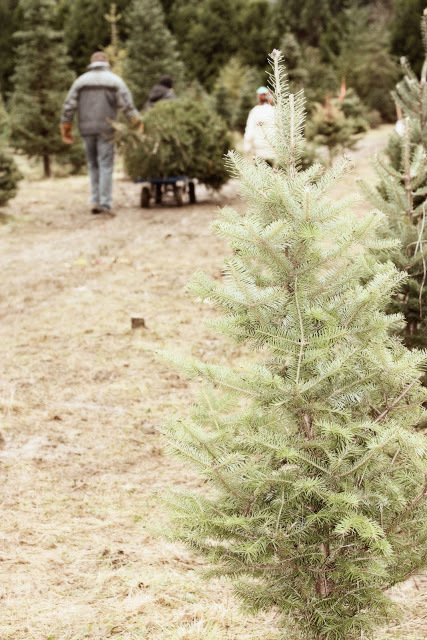 Every year, on the first weekend of December, we head out to find the perfect tree. This year it started out with a full Christmas breakfast. 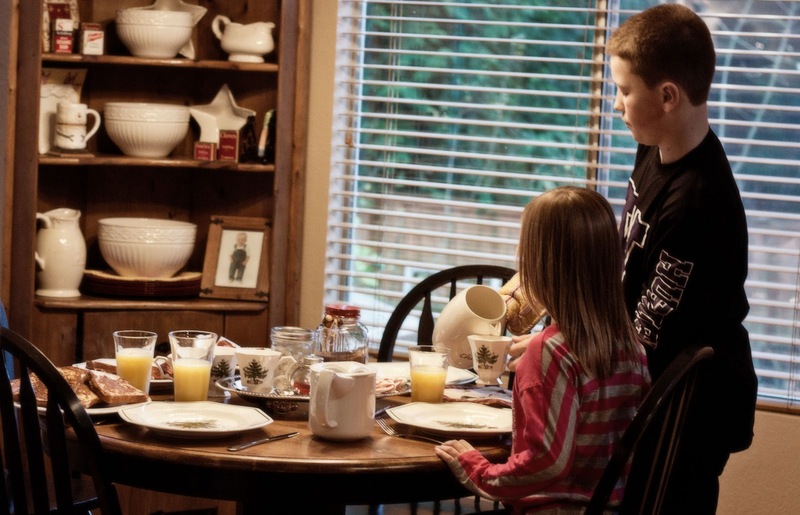 We had french toast, bacon, OJ, and cocoa, all served on our special Christmas dishes. 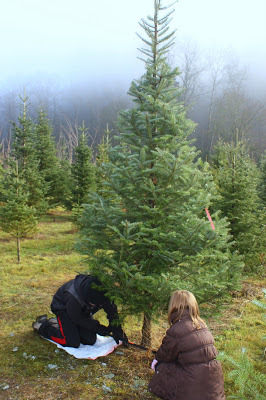 After about 20 minutes of examining every single tree on the farm, we settled on the perfect 9 footer. We have two trees in our house. The fake tree sits in the family room. It has all of the kids’ ornaments. Every year they get to buy a new ornament for the tree. 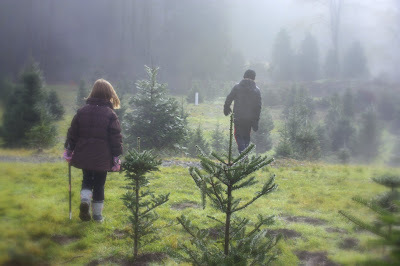 Years from now, when they are ready to move out of the house, we’ll pack up the ornaments they’ve chosen year after year, and they’ll have a beautiful tree of their own. For now, it’s the favorite tree in the house. Here’s one tree (the fake one). I’ll have to show you the real tree, in the living room, tomorrow. We ran out of lights and it’s only half decorated. For now, here’s a peak. My BFF, Laura at Finding Home, (I may just be stalking her) posted her hot chocolate station last week. 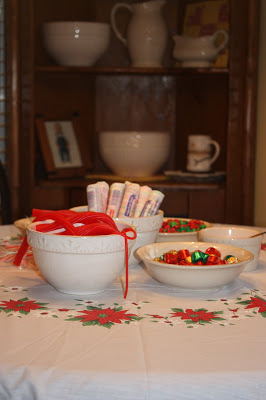 While we have a hot cocoa station set up in the kitchen, mine did not look as cute as Laura’s. So, I cutesy-fied it! 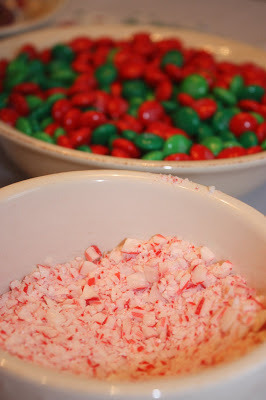 Hot chocolate, marshmallows, sprinkles, and candy canes make a perfect set up. I didn’t have a cute antique tray, like my BFF, but I did have a pretty silver platter that my Mother-In-Law gave me. The Christmas tree mugs were from my Sister-In-Law. 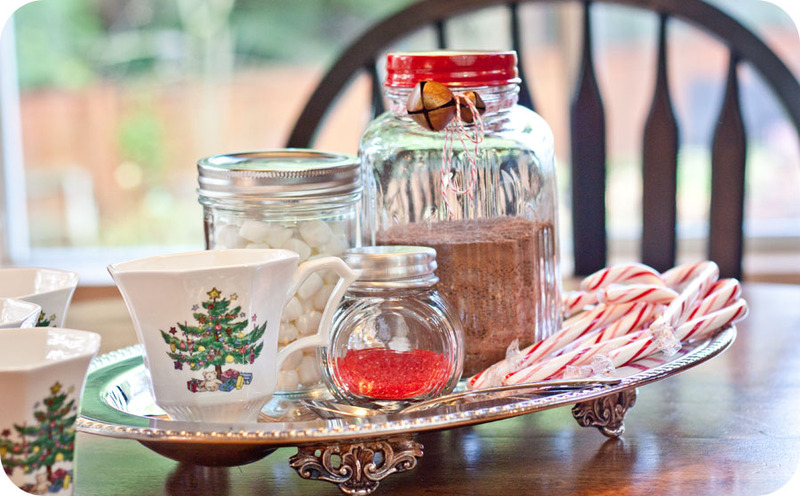 Do you have a hot cocoa station in your kitchen? Send me a picture. I’d love to see it. 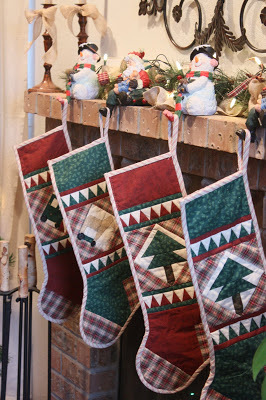 I made two of these paper-pattern-pieced stockings before our kids were born. Always a planner, I bought lots of extra fabric. 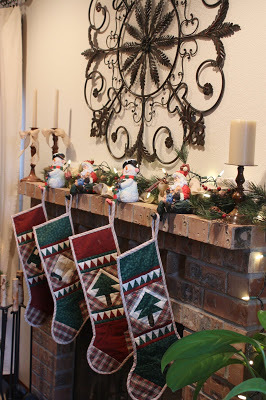 We added the train and horse stockings a few years later. They still make me happy. I often wonder how much of my day is spent looking through the camera lens. I absolutely love taking pictures of my kids. 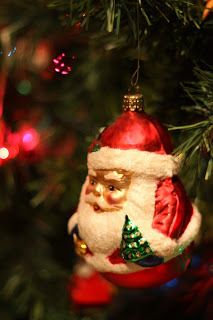 Today was Christmas Tree Day. It’s been a tradition for as long as I can remember. Of course, I brought my camera along. I’m still learning how to take clear, sharp, pictures and I am in the very, very beginning stages of learning about Photoshop. I tried to add a little glow in this picture to capture the sun trying to break through the fog. 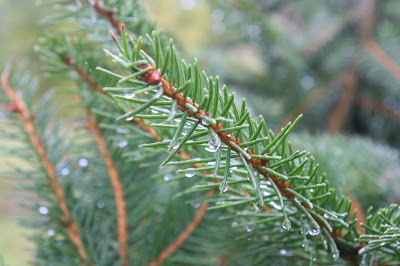 I didn’t have my big, zoomy, lens but wanted to try some close ups of the water drops on the trees. At this point, my mother started laughing at me. 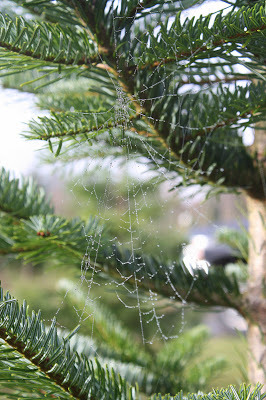 “Why are you taking pictures of cob webs again?” I think I need to work on the whole dew-on-the-spiderweb look, because you can hardly tell there is a spiderweb there. In the end, we found the perfect tree. The kids always want to help cut the tree. My hubby is so patient and lets them try as long as they’d like. 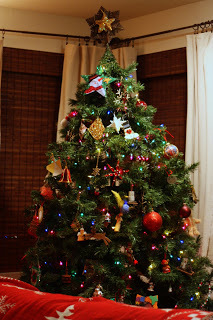 The tree is up, but we snuggled on the couch and watched a movie instead of putting the lights on and decorating. Maybe tomorrow. We’re a two-tree-household. As soon as the last of the turkey is gobbled up, the kids start asking about the tree. This is tree #1. This is the fake tree that we put up in the family room. This one is for the kids. 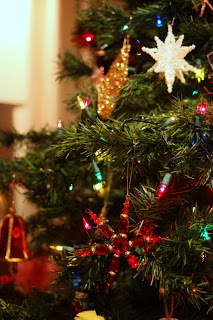 It’s the messy tree, but it’s the favorite tree to decorate. 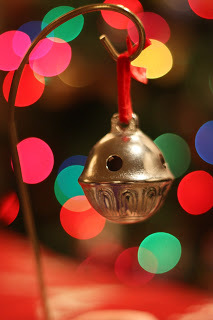 Every year the kids each get to pick out a new ornament. 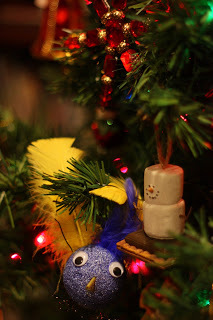 The goal is to have a good collection started, when they are ready to move out and decorate their own tree someday. 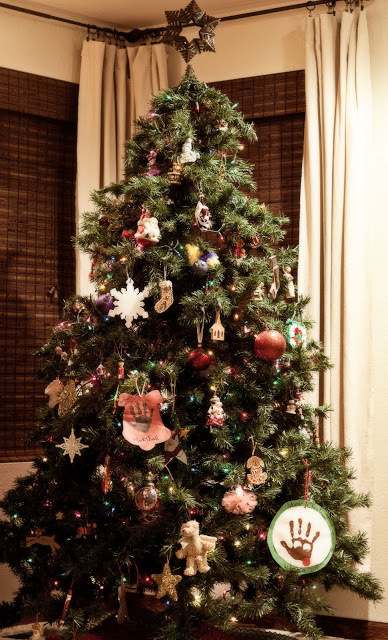 This tree is filled with the ornaments I receive as teacher gifts, the paper handprints the kids made in preschool, and a few family favorites. I let the kids choose everything about this tree. This tree is all about the memories. I love listening to the kids’ stories as they carefully unpack each ornament. 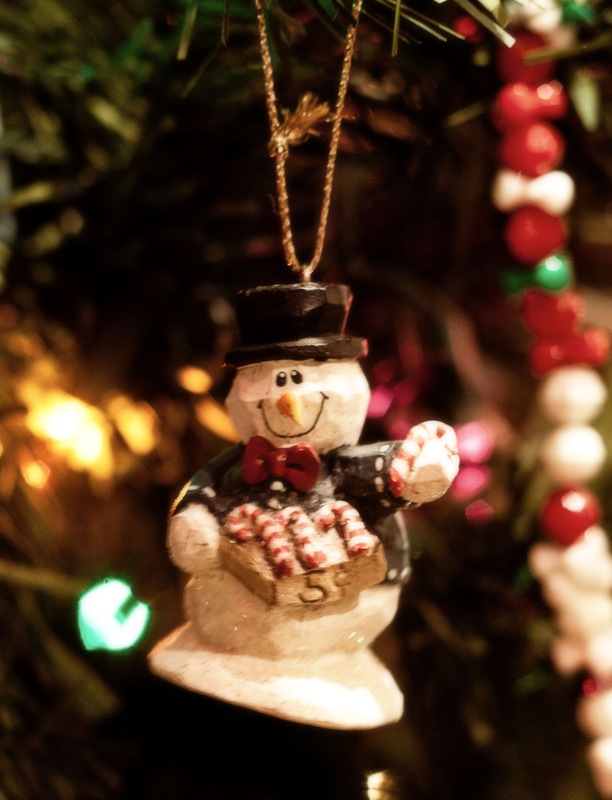 Most ornaments hold a memory for my kids. Some are just pretty. Some are not so pretty, but always seem to make it onto the tree anyway. It’s ok. This tree is their tree. This tree hold the magic of Christmas. 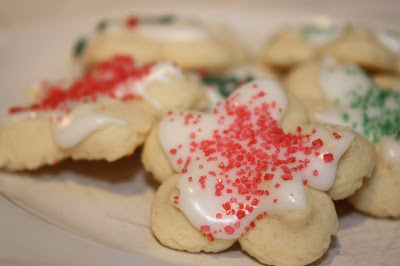 One of my favorites will always be Spritz Cookies. This is a SUPER easy cookie. 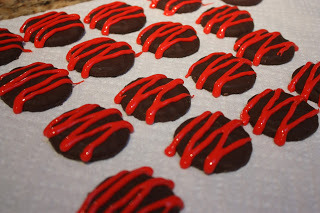 We bought the chocolate covered Oreos from the grocery store and drizzled a little red frosting over the top. 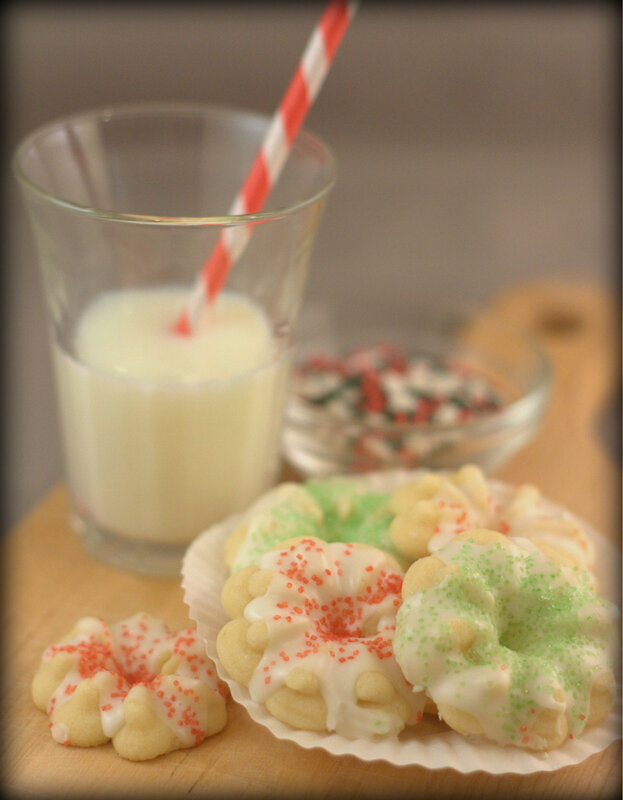 I also love to use the white fudge covered cookies. They look very pretty with green frosting drizzled over them. 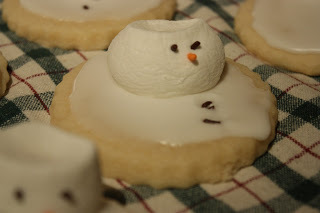 These are kind of my “filler cookie” to fill up the plate without a lot of extra work. 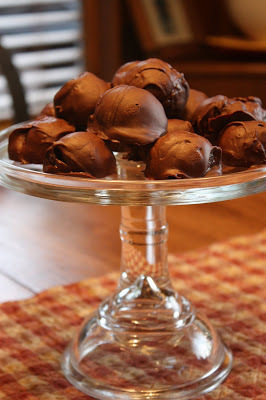 These are a favorite of my kids’. 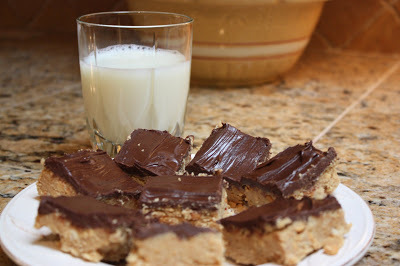 Oh, those peanut butter cup bars… yum. 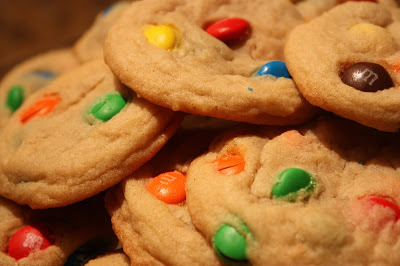 You can’t go wrong with classic M&M cookies. These were really fun and easy. I love how cute they turned out. We’ve eaten our fair share this season. New Year’s will bring a little less baking and a little more healthy cooking. 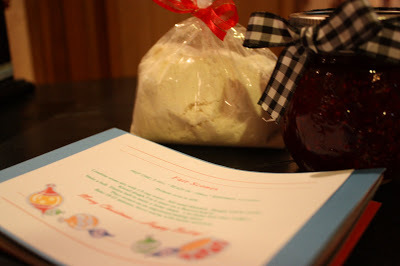 If you are looking for any of the recipes for these cookies, you can type the cookie name into the search box on my blog. 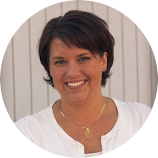 It will take you to the blog post with the recipes. We finally made it to Christmas Break! I’m one happy teacher!!! 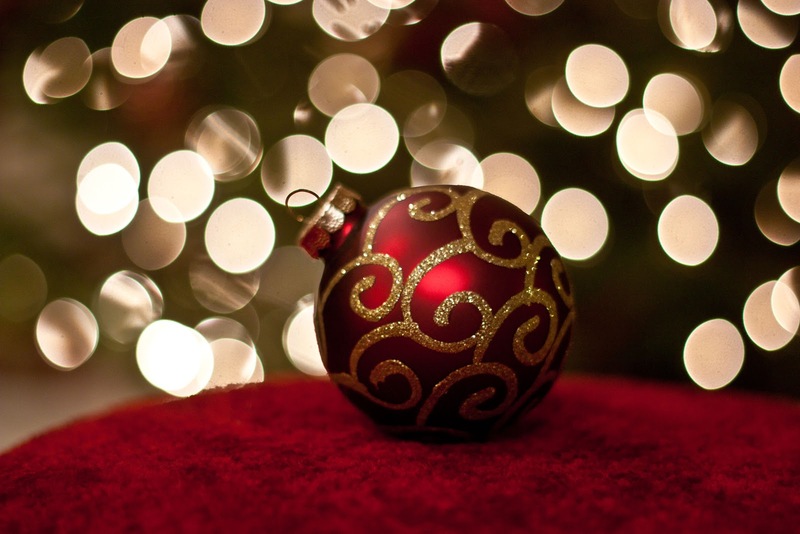 There is nothing better than being able to focus all of my attention on my family, especially at Christmas time. 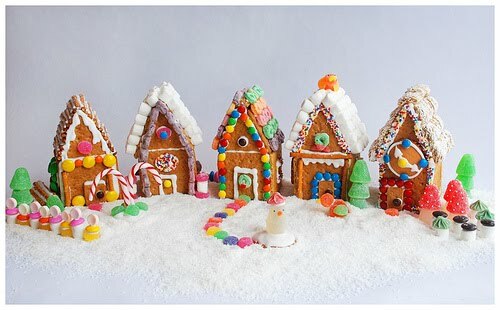 Next week we’ll invite a few family members over for our annual “Gingerbread House Day” and my house will be filled with sugared up kids and lots of fun! Before I tell you about the day itself, I need to share a little history. Fifteen years ago, when I was doing my student teaching, my cooperating teacher coordinated a gingerbread day for the first graders. They each brought in a candy item to share with the group. 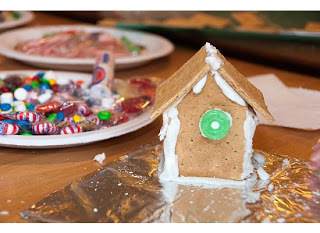 She made the house bases in advance and the kids had a ball decorating the houses with all the candy they had collected. It was the perfect fun and festive day for the kids, without being too Christmas-like for public schools. 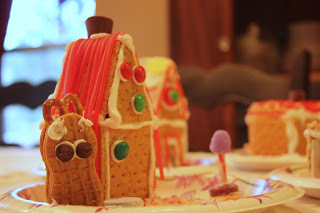 When I finished my student teaching, my cooperating teacher gave me a packet filled with everything I’d need to coordinate my own Gingerbread Day when I had my own classroom. So, at my new school, I became the Gingerbread Queen. Not only did I coordinate Gingerbread Day for my class, I was the coordinator for our entire primary staff. It was such a terrific day! Every class from kindergarten through third grade participated on the same day and we had a walk through tour at the end of the day. Each year the houses became harder and harder to build. 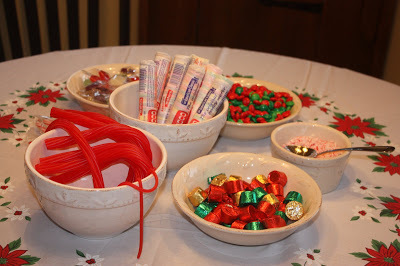 By third grade, the teachers had the kids “purchasing” their candy items after writing a detailed plan for building. Fast forward a few years, and now I’m back teaching at that original school. It’s still a first grade tradition at this school, so we don’t get to do Gingerbread Day in kindergarten. 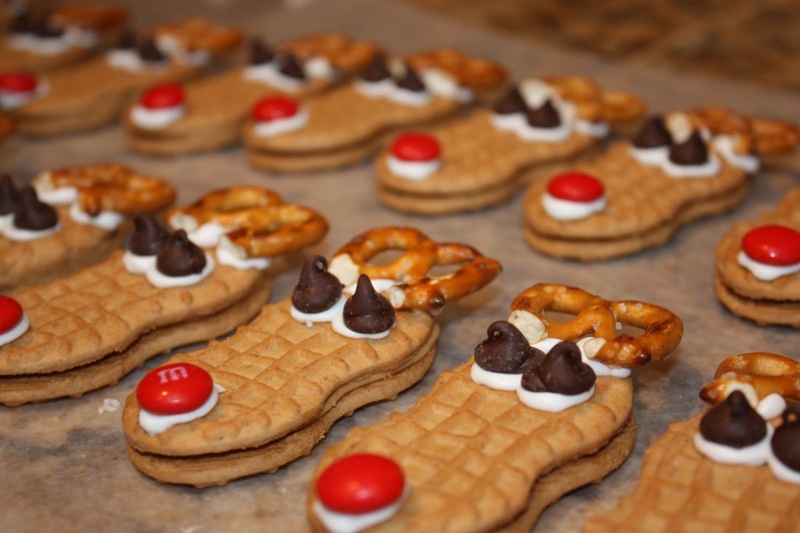 But, I still get to be the Gingerbread Queen. 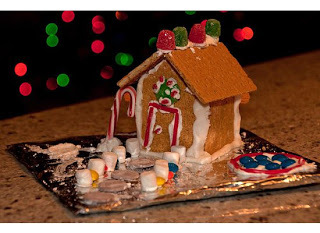 You see, when my son was 2 (7 years ago) I started hosting a gingerbread party for my kids’ friends and cousins. I usually cover the entire table with craft paper. Michael’s sells rolls of craft paper. It makes cleanup a lot easier. When the kids were little, I prepared the house bases ahead of time. Now we just build and create! Sometimes the candy houses turn into candy fortresses. 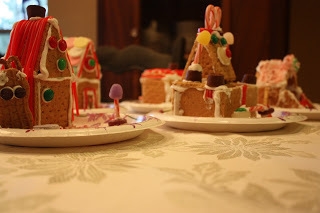 Here’s how I build the bases when young kids (first grade and under) are decorating with us. 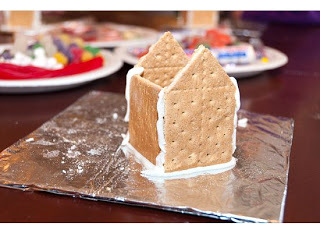 The only reason I do the base for the kids is that it is very frustrating when you are 4 years old and your house falls apart every time you try to add candy. Royal icing needs time to dry and harden. Patience is hard when you’re 4. Building the house bases is really easy. I start with foil covered cardboard. They make simple platforms for the kids to create their “yard”. I cut the graham crackers with a bread knife and assemble the house base with royal icing. 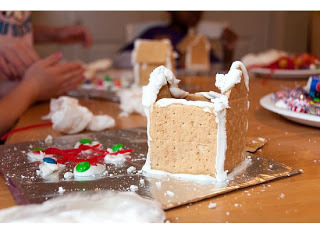 I always use the royal icing to “glue” the house base to the platform. This is what an assembled house base looks like when it is ready for the party to start.. I make one for each child and a few extras in case we have an accident. 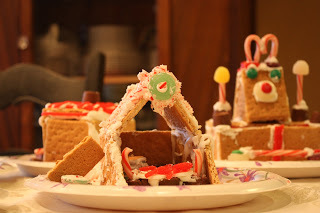 I let the kids add the two pieces for the roof and all of the decorations. 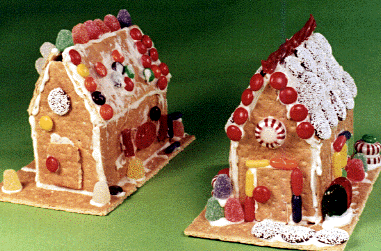 Royal icing is best for assembling houses and decorating. 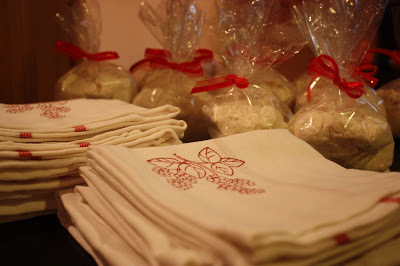 I usually make several batches of Royal icing and put it into individual quart sized freezer bags. When it’s time for decorating, I just snip off s small corner of the bag. Here are a few examples from our gingerbread party last year. You can see how I build bases for the younger kids and just let the older kids build their own fortress. This one was Rudolph’s barn. This is a gingerbread manger. If you’ve never done this before, this is the year to give it a try. My kids always look forward to this day. I’ll admit, I’ve toned it down over the years. The first few years we invited about 30 kids and their parents, served lunch, and hosted all-out party. Now, we just have family. 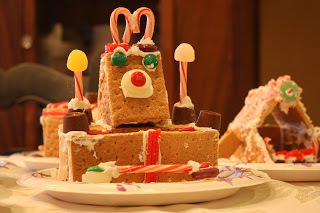 There are 10 kids and one crazy mom who just loves being the Gingerbread Queen.